We know that SWAG, patches, neckerchiefs, bags, and everything, are a very exciting part of getting ready for the Jamboree. Today, Katy Withers, Contingent SWAG Coordinator, breaks down all the pieces of SWAG that you’ll be getting as a part of the US Contingent (both Participants and IST!). The USA Contingent will also have lots of optional merchandise which can be purchased though BSA Supply’s online store here. There will be a 2-week window before the site is advertised to the general Scouting “Public” which we hope you will take advantage of to purchase your favorite souvenirs, collectibles, and trading items before the site is advertised more broadly by the Scoutshop.org. Hint: the first person who publishes the website link on social media will definitely shorten that 2-week planned exclusive window of opportunity! SWAG stands for “Stuff We All Get”. It’s your gear kit which is included with your Jamboree registration fees. Our Contingent SWAG is provided to Unit Participants and their Leaders, to International Service Team (IST) members from the USA, and to the USA Contingent Management Team (CMT). What’s in each SWAG bag? 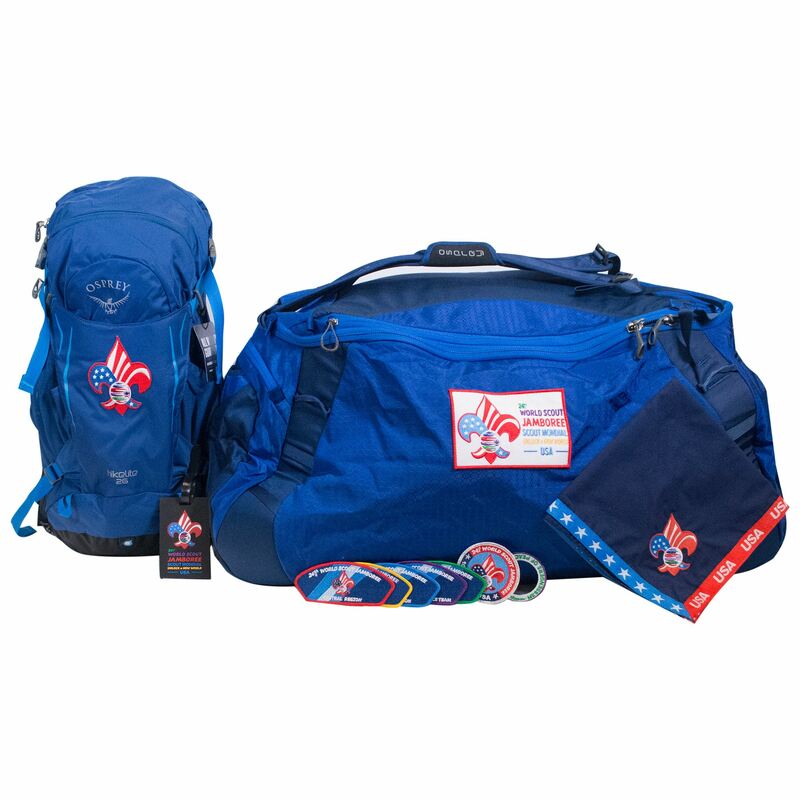 Each person’s SWAG bag contains a 2nd USA Contingent round emblem like the one you’ve already received, an Osprey 115L Transporter duffel bag, an Osprey Hikelite 26 daypack, 2 luggage tags, 3 neckerchiefs, and 4 Jamboree shoulder patches (JSPs) from your region. Unit participants and leaders will also receive a Messengers of Peace ring which can be sewn around the World Crest on your Field uniform. 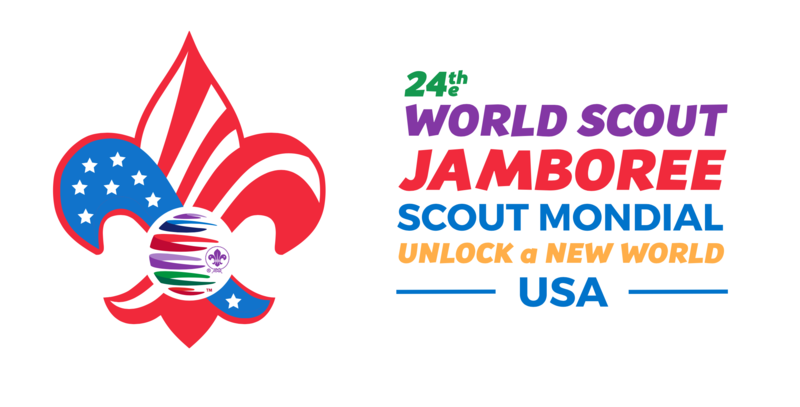 Service as IST or CMT during World Jamboree does qualify as a Messengers of Peace – the MOP ring will be provided to the USA Contingent’s IST and CMT during the Jamboree. When & How do I get my SWAG bag? Priority is on shipping the SWAG to all units first, followed by SWAG for IST & CMT. For Participants & Unit Leaders, the plan is to send everyone’s SWAG bag to their unit leaders in time for you to pick it up at your Shakedown campout. Shipments have already begun for the March and April shakedowns, and these shipments to leaders will continue through late April and possibly into May. If you can’t attend your shakedown, talk with your Unit Leader regarding your SWAG bag. For IST & CMT, SWAG delivery details are still being determined. For some IST & CMT, it may come in a bulk shipment to your local scout office, for others, it may be shipped directly to you. You will be informed about your SWAG delivery in due time. What do the different color borders on the JSPs mean? There are 5 different borders on the JSPs. Each one represents a different Region. Purple is the color on the IST’s shoulder patch. Northeast Region’s border is blue. Western Region’s is green. Central Region has a red border, and Southern Region’s border is yellow. As mentioned above, each person receives 4 JSPs in the color which represents their region. Additional JSPs from all regions will be available for purchase in the online store. What else do I need to bring besides my SWAG? Everyone will need certain personal and camping gear to be comfortable at Jamboree, but there is also a lot of gear provided for participants. As an example, all tents and cots are provided, but you’ll need your own sleeping bag, pad, and pillow. A full gear list and packing guide for unit participants and leaders can be found in the Flash Friday Update (Dec 7, 2018), & on page 4 of the March 2019 WoJam Unlocked. For IST & CMT – Utilize the same gear list but please note – no mess kit required, as you’ll be eating in one of 3 staff dining halls. You’ll still need water bottles & a lunch bag to assemble your lunch each day. In addition to carrying your lunch sack and daily gear in your daypack, you’ll need a way to carry water with you at all times. Feel free to use Nalgene-style bottles you may already have, or you can order an Osprey (or another brand) hydration bladder to fit into your daypack. The Osprey hydration bladders are available from several vendors, including REI, Amazon, and Osprey. If using a hydration bladder, a 2 – 3L option should fit. If using a Nalgene-style option, a 32 oz bottle fits well into side pockets, and 48 oz fits, but sits slightly tall in the side pockets. 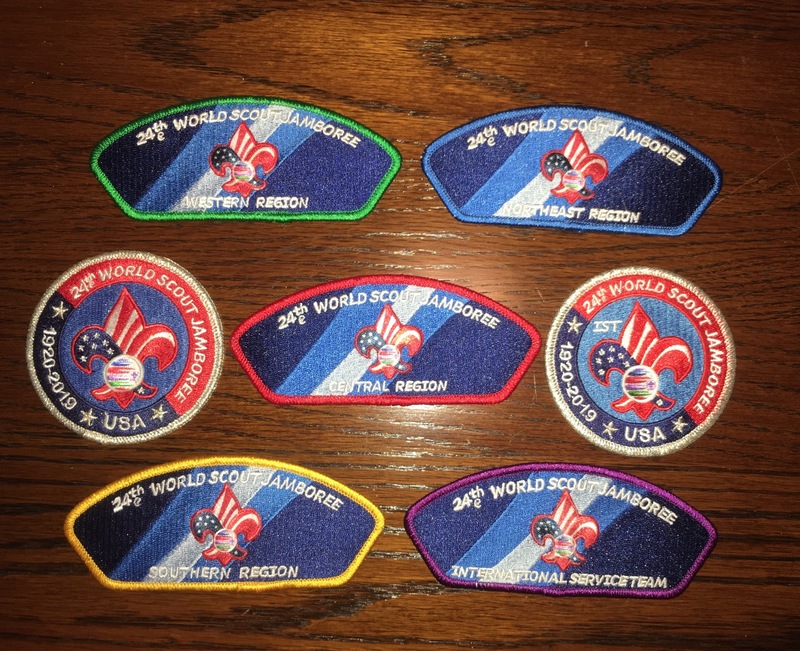 When will we get the official host World Jamboree Patch?! As with previous World Jamborees, the official 24th World Scout Jamboree Patch will be given to everyone at the Jamboree. This patch is special – it signals your actual participation at WSJ2019, so you have to be there to receive it! 😉 Yes, this means you either need to save it, or bring something to sew it onto your uniform while at Jambo. It gets sewn on above the right uniform pocket. A memorable activity at jamborees is to trade, swap, or gift items with other scouts from around the world. A favorite at our National Jamborees is patches, or as much of the world calls them, “Badges”. A favorite at World Jamborees is the neckerchief, aka “neckie” and “necker”. You’ll also see scouts swap shirts, full uniforms, souvenirs, meals, and small gifts from their hometown and country. At a World Jamboree, it’s important to remember that some scouts may not have the same quantity or variety of items to swap and gift. For instance, some contingents including the UK have been known in the past to only provide two official neckerchiefs causing some of those scouts to be more hesitant about trading them. The most important thing is to make sure you share something special with new friends, not that you get the best deal! See our other USA Contingent SWAG Coordinator Christa Waterwiese’s blog post on trading here.